Welcome to the Old Dominion Miniature Horse Club of Virginia (ODMHC). The club was formed in 2011 to promote and stimulate the sale, breeding, exhibition, and ownership of the Miniature Horse in Virginia and beyond. Virginia and Miniature Horses have a long and prestigious history. We aim to put Virginia back on the top of the industry. ODMHC is sanctioned by AMHA and AMHR. Our plans include starting a Virginia-Bred Incentive Fund offering paybacks to reward the showing of Miniature Horses bred in Virginia. You do not have to be a Virginia resident, just a member of the club to participate. These are big ambitions, but we are dedicated to the cause. Please consider joining us. If you are new to the wonderful world of minis, any of the club members are at the ready to assist and advise you. The American Miniature Horse is a unique breed, the limiting characteristic of which is size. It must not measure in excess of 34 inches in height, which is measured at the withers, at the last hairs of the mane. It must be a sound, well-balanced horse, possessing the proper conformation characteristics which are common to most of the larger breeds. In fact, if there were no size reference, the miniature horse might give the illusion of being a full-sized horse. The American Miniature Horse gives the impression of strength, agility, and alert intelligence and is available in all possible colors. The first mention of a small horse being imported into the United States was in 1888; and research shows little public awareness of true Miniatures until 1960. Throughout its colorful past, the Miniature Horse breed has been bred for pets, novelty, research, monetary gain, mining work, exhibition and royal gifts. A Standard of Perfection was adopted in 1978 and that two basic body types, a "draft" type and a fine-boned "refined" type, were present in the existing foundation stock, the Standard called for a blending of types into an elegant little horse. NUTRI TION: It's important to understand the nutritional needs of Miniature Horses. Miniatures are prone to overeating and can develop problems from excessive food intake. Nutrition for Miniature Horse is similar to that for large horses but the differences in body size must always be considered. Miniature Horses will normally require a daily ration of grain and hay. Two feedings daily are the minimum when feeding Miniature Horses because of the size of their intestinal tract and the need for continual movement of food in their system. Plenty of clean water should always be available. Pasture access must be limited when the grass is long and lush or founder (a painful and crippling condition) may result. As with all horses, feeding should be tailored to the individual animal. 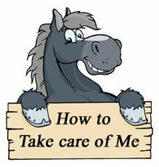 Check with your veterinarian on an appropriate feeding program for your particular horse. HOUSING: Miniatures, though small, are hardy animals. They thrive on pasture, sunshine and room to run and play. If you are not planning to show your American Miniature Horse, a three-sided, run-in shed for protection from cold winds and wet weather is usually sufficient shelter. During the show season, show horses are usually kept in individual stalls in a barn, but keep in mind they still need turn-out time to run and play. HOOF CARE: Hoof care in Miniature Horses is essential. Owners need to have young horses' feet trimmed at an early age to help avoid any conformational problems. Hooves should be picked out every day and trimmed for balance on a regular schedule. Try to choose a farrier who specializes in working with Miniatures. Neglected or improperly trimmed feet can cause serious problems. WHETHER your American Miniature is a show horse, breeding stock, or companion, regular grooming is an essential aspect of his total care. Not only does the horse benefit from your grooming, he also becomes accustomed to your touch. This creates a special bond between you and your horse. When grooming, always brush and comb with the hair, never against it. This will keep coat soft and shiny and the mane and tail free of tangles. During fly season, the horse will appreciate a light covering of fly spray. While bathing is occasionally necessary and an important part of the process, Miniatures should not be bathed too frequently as bathing removes much of the natural oil from a horse's coat. VETERINARY CARE: If you purchase an American Miniature Horse from someone in your area, ask that person to recommend a local veterinarian. You and your veterinarian will want to establish a comprehensive health program for your Miniature, which should include a regular immunization schedule. They type of immunizations required for your horse will vary depending on your intended use and geographic location. You will also need to develop a deworming program for your Miniature Horse. All horses are prone to internal parasites and these parasites can severely affect your Miniature Horse's general health and performance if left unchecked. Your veterinarian will suggest a deworming schedule based on your horse's living environment and geographic location. In general, it is a good idea to have a veterinarian who is familiar with your horse and his health history so the best possible care can be provided in an emergency situation. After discovering the wonderful qualities American Miniature Horses possess and realizing how easy and inexpensive it is to care for them, it may be time to find one of your very own. The first thing to consider is what you plan to do with your Miniature Horse. While everyone loves to watch a flashy, spirited Miniature it may not be the right horse for you if your interest is in pleasure driving or you are a beginner at showmanship. Take the time to look for that special American Miniature Horse that is just right for everything you want to do. Once you have the criteria for your choice of an American Miniature Horse, you're ready to begin the selection process. 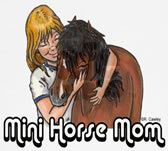 The Associations have informative websites, http://www.amha.com and http://www.shetlandminiature.com , which contain a wealth of information and photos as well as a list of sponsor farms, clubs, and businesses. When requested, AMHA & AMHR will also provide you with a directory of breeders and local clubs. It is a good idea to make an appointment to visit the farm or breeder when you have located a Miniature Horse you want to see. Feel free to ask questions. Ask about the horse's height, health history, level of training, previous use, and why the owner is selling the horse. Before you purchase an American Miniature Horse, you will want to observe several things. Read the 'Breed Standard of Perfection'. Check carefully for signs of general good health and vitality: a shiny coat, bright eyes, and alert attitude are some of the things you will want to see. How does the horse act toward people? Is he friendly? Finally, make sure all paperwork is in order. You should receive a signed Transfer Form and/ or Bill of Sale provided by AMHA or AMHR and the original Registration Certificate. Check to make sure you are purchasing the animal from the last recorded owner on the Registration Certificate. The goal of any breed organization is the integrity and maintenance of bloodline records. Since the first Miniature Horses of the Middle Ages, this unique animal has survived and thrived. The Miniature Horse industry now has an exciting, financially rewarding and personally satisfying future. As more and more people discover these classically beautiful horses, their popularity and value will continue to grow.